Try this easy Crockpot shredded beef taco recipe that will have your taste buds dancing. Great for meal prep during the week or to serve a crowd. Oh, and it’s gluten-free and dairy-free too! If you know me, then you know how much I love tacos. Chicken tacos, shrimp tacos, pork tacos, beef tacos, quinoa tacos. ALL the tacos. I’m not sure if my love for tacos is so great because they are so gluten-free friendly or it’s that they’re just so dang delicious. Let’s go with a combination of both. Well these shredded beef tacos may be the queen of all the tacos. A perfect corn (gluten-free of course) tortilla wrapped around tender shredded beef, topped with sliced avocado, sautéed onions and bell peppers and a fresh salsa (try my jicama kiwi mango salsa on these – to die for!). Honestly, what more could you want? Oh, how about a crock pot recipe to make it even easier? Yes, please! These tacos are great for reheating all week for lunches or they can serve a large crowd! Michael and I had them as tacos a few weeks ago for lunches and then used leftover meat for salads, rice bowls, breakfast burritos, etc. Making meat like this can be so versatile that you never feel like you’re eating the same thing twice. Then, this past weekend, my family served these tacos for dinner for about 15 people. We had loads of sides and toppings, which made this recipe an easy party recipe! I will let you in on my favorite little taco secret though. Make sure you warm your corn tortillas right before serving. To do this, just turn your oven on to 350F. Pop those corn tortillas right on the oven rack (or on a baking sheet) for 2-5 minutes so they get a little toasty. This will take your taco game to a whole new level. It provides great flavor and texture, but most importantly it makes those tacos sturdy with less chance of them breaking! Who wants a soggy taco? Not me! Tell me in the comments.. what’s your favorite crock pot recipe? 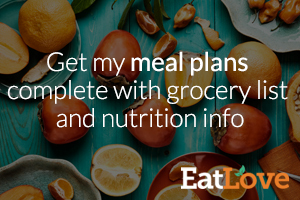 If you love my recipes, check out my meal plans at Eat Love! Try this easy Crockpot shredded beef taco recipe that will have your taste buds dancing. Great for meal prep during the week or to serve a crowd. Oh, and it's gluten-free and dairy-free too! Add the beef to a crock pot or slow cooker. Top with tomato paste, beef broth, onion, garlic, vinegar, cumin, chili powder, cayenne pepper, salt, black pepper, and lime juice (basically everything except the cilantro). Cook on low for 8 hours or high for 5-6 hours. Shred the beef with two forks and place back in the crock pot. Add the cilantro and allow to cook another 15-20 minutes so it soaks up all the juices. To assemble the tacos, place warmed tortillas (warm them in the oven for 2-3 minutes)** on a plate and top with shredded beef, <a href="http://www.adashofmegnut.com/jicama-kiwi-mango-salsa/">jicama kiwi mango salsa</a>, sliced avocado, fresh cilantro, sautéed onions and peppers. Serve warm. *To sauté the onions and peppers, put 1 tbsp of oil in a skillet and add sliced onions and peppers. Sauté for 15-20 minutes, stirring occasionally, until the onions and peppers are soft and lightly browned. **Warming the corn tortillas makes them not only taste delicious but it also makes the corn tortillas less likely to fall apart. Preheat your oven to 350F just before serving and place the corn tortillas directly on the oven rack (or on a baking sheet if you wish) for 2-5 minutes, watching carefully so they don't burn. You just want to get them a little warm and toasty, which gives them a delicious texture and provides a great vessel for all of that taco deliciousness! This look delish! I love anything you can make in a Crock-Pot. Thanks so much! the Crock-Pot is my life saver during the summer when it’s too hot and I’m low on time!